The South African partnership of Ernie Els and Retief Goosen claimed their country’s fourth World Cup after a four-way playoff at the Taiheiyo Club, Gotemba, Japan, but it was the high drama at the 72nd hole that will long be remembered. With Denmark’s Thomas Bjorn and Soren Hansen getting down from 12 feet for a birdie four and the clubhouse lead on 24-under-par 264, they looked set to finish runners-up to New Zealand, who were on the same score playing the last, a par five that was yielding plenty of birdies. South Africa required an eagle to match Denmark’s total. 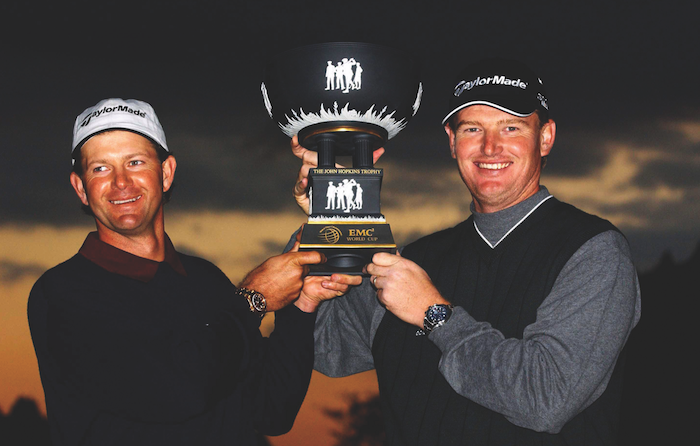 This they achieved, with Goosen playing a majestic 5-iron to four feet from the stick, and Els converting. The United States team of Tiger Woods and David Duval were in the final match with New Zealand’s Michael Campbell and David Smail. Even after the US birdied the 15th, 16th and 17th to reach 22-under, it looked too late, especially after Duval cut his approach and the ball landed in a hollow off the green. With a steep bank to negotiate, lesser mortals would have been happy just to get within 10 feet of the hole. But Woods did what he has done so often, and holed for an eagle three. The script could not have been better – a playoff after Campbell hooked his long-iron into light rough above the green, with Smail failing to put the third close enough for a birdie. But Woods’ magic deserted him at the first playoff hole, the 18th, when he pulled his drive into the trees and gave Duval no option but to chip back on to the fairway. Amazingly, Campbell’s approach had skipped through the pond surrounding the green, ‘bouncing-bomb’ style, but the Kiwis failed to capitalise and only made par. That left Denmark and South Africa, who both made birdie, to fight it out on the 14th. Bjorn opened the door when he drove into the trees, leaving Hansen only able to hack out. A par four from the South Africans was good enough for victory. Els, a World Cup winner for the second time, but the first under the World Golf Championships banner, praised his partner for his role in securing that last-hole eagle. Said Bjorn: ‘We are happy with what we achieved. It was a fantastic job to shoot 65 in foursomes and to play 72 holes without a bogey. To make one in the playoff hurt, though. It’s obviously disappointing when you are right in there, but for Soren it was a great week. It was a taste of the future for him. He’s a huge talent and it was nice for him to go out in a playoff with guys like Tiger and David and Ernie and Retief.